Part 1 of 4. In the May issue of AMC Outdoors, I highlight the different types of backcountry shelters that weigh less than 2 pounds. This four-part blog posting highlights the specific brands and styles available in each category. In this first post, I round up the ultralight tarps. Included weights are from the manufacturers and typically do not include guy lines. Specializes in ultralight backpacking gear, including the asymmetric SilTwinn Tarp (10.5 ounces, $140) and lighter weight SpinnTwinn Tarp (8.6 ounces, $175). Both are approximately 110" x 101" and feature some nice design elements for a taut pitch. Canadian company produces a line of Siltarps. The product line includes a wide range of cuts and configurations, including the basic rectangular versions (5' x 8' Siltarp, 7 ounces. $75; 8' x 10' Siltarp 2, 14 ounces, $145; 10' x 12' Siltarp 3, 20 ounces, $200). 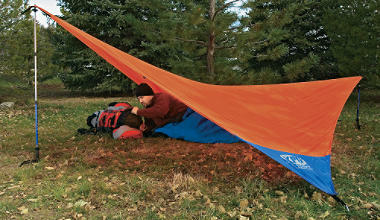 Asymmetric cuts include the 2-person Silwing (pictured, 12 ounces, $135) and Silshelter (16.5 ounces, $170). Brooks Range Mountaineering Equipment CompanyThe California-based company makes a range of ultralight tarps, from a 5' x 8' solo tarp (8.7 ounces; $75) to a 10' x 10' Guide+ Tarp (13 ounces; $179). Venerable outdoor gear maker offers its XPG Ultralight Wing (10' x 10', 15 ounces, $80; 12' x 12', 19 ounces, $100). Excellent value for an ultralight tarp. Montana-based company makes their Crazy Standard Tarp, a larger-sized (77" x 104"), heavier-duty tarp made from 70d ripstop nylon. Good value, but on the heavy side (28 ounces, $60). 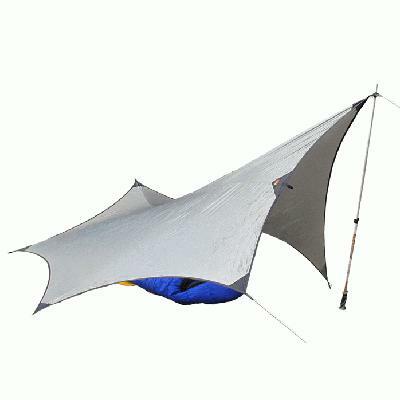 ExpedSwiss company offers the Scout Tarp Extreme (pictured), a substantial (11.4' x 9.4') tarp designed to be pitched as an A-frame with coverage for up to four people (28 ounces, $175). 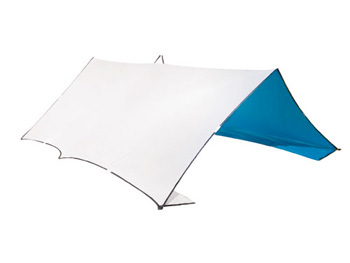 Granite GearMakes the only tarp designed with winter use in mind: the Northern Light (8' x 8', 21 ounces, $140), which features snow flaps along the sides (pictured). Also offers the White Lightnin' for three-season use in three different sizes (19-26 ounces, $130). Ultralight tarps are available from other manufacturers—these are just the ones that caught my eye.